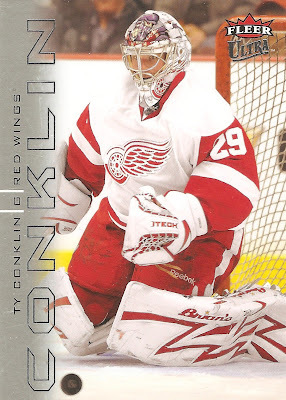 Lately I've been finding myself wanting to put a little more effort into my general Red Wings collection, so when I had a chance to stop by one of my local card shops yesterday, I made sure I did what I could to get some nice stuff for the PC. That meant flipping through the dime, quarter, and dollar boxes, all of which provided me with something to show. Let's start with the dime box, which was pretty much filled with Red Wings, although most of them were from the early 90's. I ended up grabbing five new cards for a nice fifty cents. 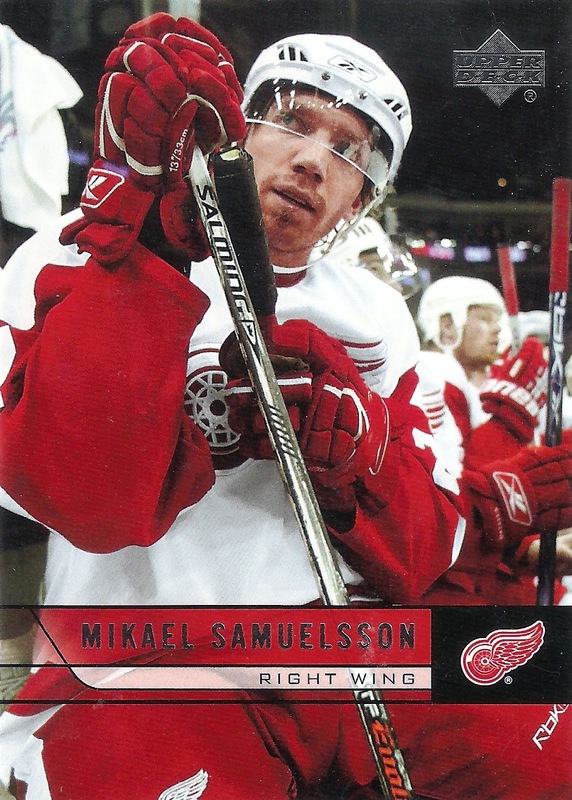 The first was this Mikael Samuelsson from 06-07 Upper Deck. The picture is what stuck out to me on this one. That's not a photo you see every day on a card. 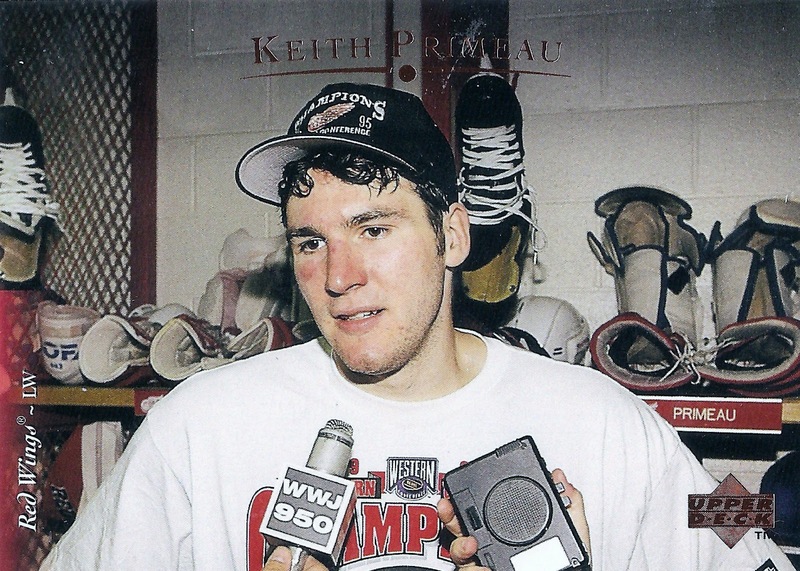 The second was this Keith Primeau from 1995-96 Upper Deck. I thought it was an interesting picture, probably taken immediately after the Wings clinched the Western Conference during the 95 playoffs. If I remember correctly, they beat the Hawks in that series. Then there was this Ty Conklin from 09-10 OPC. 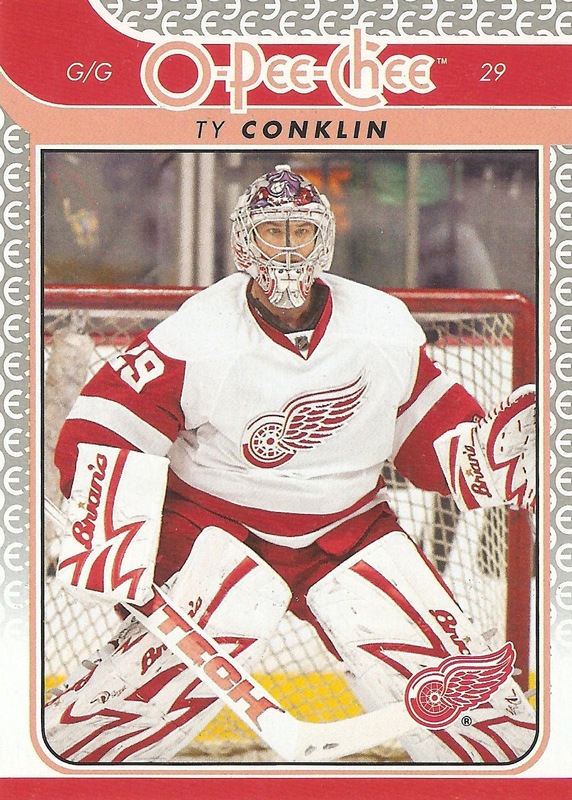 Nothing special here, but for $0.10 it was a nice looking card of another Red Wings goaltender, so it was kind of hard to pass up. Here's another Conklin, this time from 09-10 Ultra. Definitely a better looking card than the OPC if you ask me. Ultra has some really nice designs, but the set never gets much love it seems. 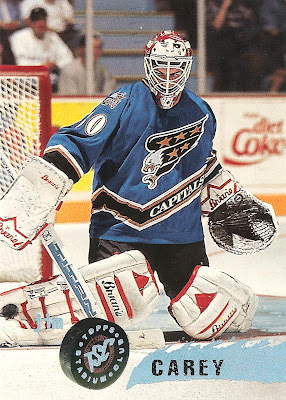 One thing I always liked about Conks was his mask featuring the octopus on the front. 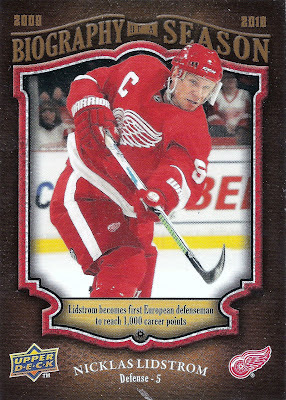 Lastly is a checklist, featuring Nicklas Lidstrom from 07-08 Upper Deck. I had never seen the checklists from this set, so when I came across it I had to have it. 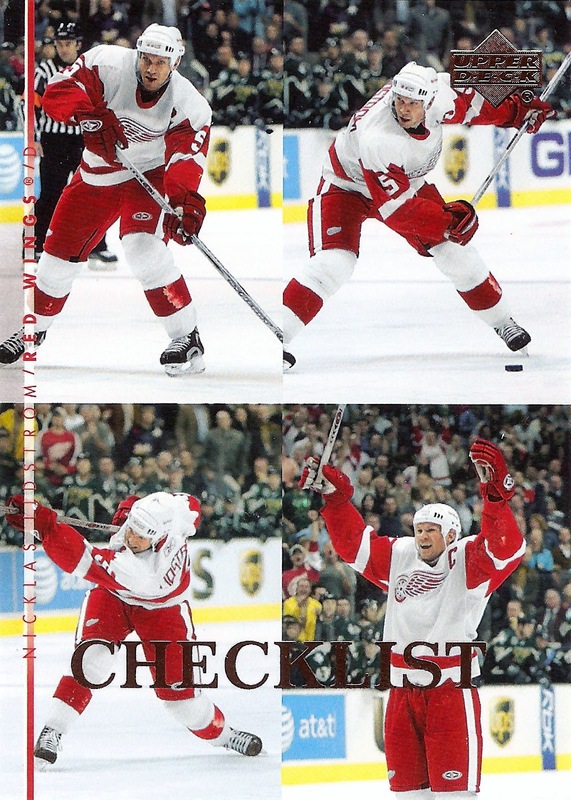 I love the way it's split into four consecutive pics of Lidstrom scoring a goal from the blue line. Now onto the quarter box where I found a few more nice cards for the Wings PC. 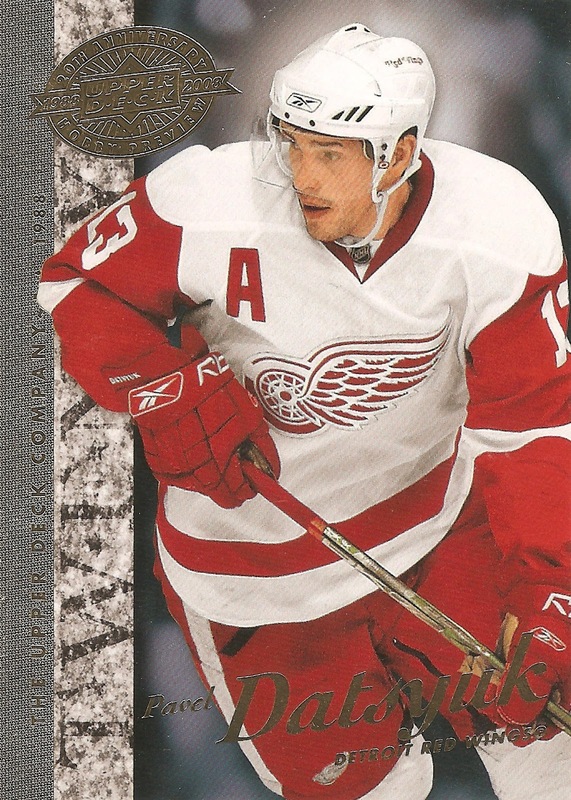 The first was this Pavel Datsyuk special edition hobby preview card from Upper Deck. I never knew he was part of this set, so it was a welcome addition to the collection. 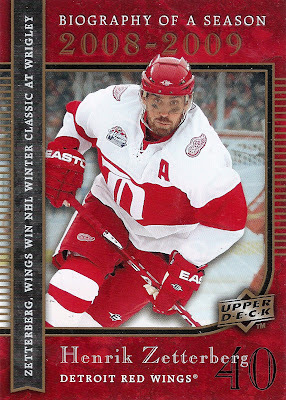 Here you've got a Hank Zetterberg from the same set, another one I didn't even know existed. These cards are actually pretty nice looking in person. I believe they were handed out at hobby shops with UD product. I remember getting a Crosby from my LCS at the time. 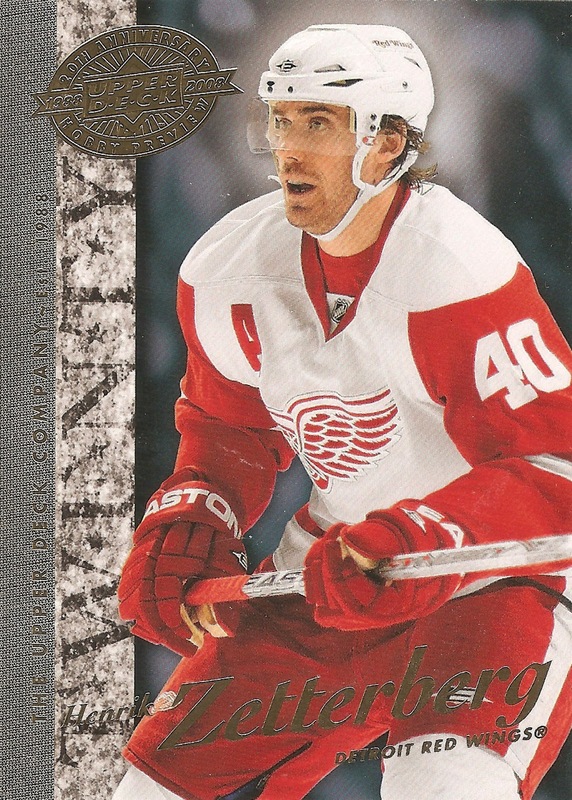 Next is another Zetterberg, this time from Upper Deck's biography of a season set. This one is from 2008-09 and chronicles how the Wings handed the Hawks a loss at Wrigley Field during the Winter Classic. Man, I can't wait for Wings/Leafs at The Big House next winter. Here's another biography of a season card, focusing on Nicklas Lidstrom reaching the 1000 career point mark during the 2009-10 season. 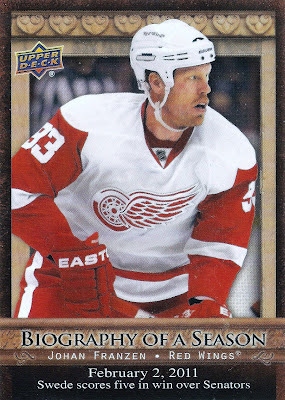 One more bigraphy of a season, this time featuring Johan Franzen and his explosive five goal performance against the Ottawa Senators. If only he could've played like that this postseason, the Wings may not be headed for the golf course already. 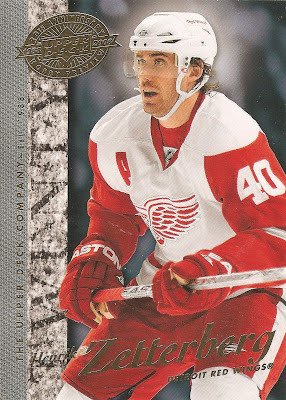 The last from the quarter box is of current Red Wing Todd Bertuzzi, shown with the New York Islanders. It's an X-Axis Fractal Matrix Die Cut from 97-98 Leaf. I've always loved this set and for only $0.25 I figured what the heck. Lastly, we have the dollar box. I didn't expect to find much in there hockey wise, at least that's what the guy told me, then this popped out. It's a Mike Richter The Mask II card from Between The Pipes. For only $1 I had to have it. Kind of makes me want to start going after all the mask cards again. I've got close to 20 of them now. All in all it was a good haul as I grabbed some supplies too, all for under $10. Kind of makes me want to hit up another card show here soon just to pick through all the dime, quarter, and dollar boxes there. You never know what you'll find, right? Here's a card that's been on my radar for over a year now. I have the OPC base and retro, I've always just needed the retro black border and blank back parallels. The black border is numbered to 100 and I've seen a handful of them online, but the blank back is a different story. I've only seen one or two, and these have been out for two years now. Here's the front of the card, which is the exact same as the regular retro parallel. This one I would put down as another eBay steal, as I got it for far less than I ever thought I would. Supposedly, there are only 5 copies of this card in existence, but without official confirmation of the print runs from Upper Deck, who knows? What do you guys think, are blank backs worth any kind of premium, especially when it comes to player collections? Even if there are more like 20 of each card, that's still pretty rare all things considered, so I'll definitely take it for around $5 delivered. Guess it's back to everyday life after my team was eliminated by the Predators over the weekend. Can't win every year, right? At least I'm not alone as the other three teams I despise (Vancouver, San Jose, and Pittsburgh) were all ousted as well. And at least the Wings were the fifth seed and not expected to do as much as say, the Pens or Canucks. On the collection front however, I had a great weekend getting three separate packages from eBay purchases all on Friday. 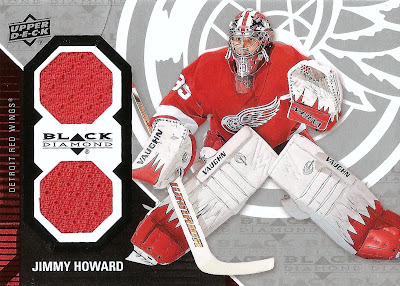 One of them contained this beauty of a jersey card from 2011-12 Black Diamond. I've seen tons of these on eBay, but never wanted to pay more than $5, so when this one popped up with a BIN for $1.99 I had to go for it. The only thing I don't like about the card is the slight crease above the upper jersey swatch window. You can see it as a dark line running from the point of the octagon to the top edge of the card. Oh well, it's not worth the hassle going back and forth with the seller over a small blemish on an otherwise nice card. This is another project that I have not been able to update much lately, not for a lack of effort, but mainly because of a lack of availability. I've actually only added two of them dating back almost a year now, so that tells you how hard these things are to find. Anyway, I found this one with one of my daily eBay searches a few days ago and started off the biding. It went back and forth for a little while at first, but I ended up coming out on top with a bid around $7. Throw in a few bucks for shipping and I brought this one home for around $10, not bad if you ask me. Pretty much par for the course for this set. This Karalahti is the second King I've added to the collection. It also puts me at a total of 24 out of a possible 220 now. It's definitely a good feeling seeing myself beyond the 10% number with this project. I know I will probably never even get close to complete, but that's what makes the chase so much more fun, I will always have something to look for. I'm closing in on 400 posts here now, this being number 399. I can't believe I've made it this far, as I thought it would just be something I did casually for a while then subsequently lose interest. Well, that has yet to happen as I still enjoy this hobby each and every day, thanks in large part to the hockey card blogging community. Anyway, here's another one I managed to grab for a great price during my latest eBay spending spree. 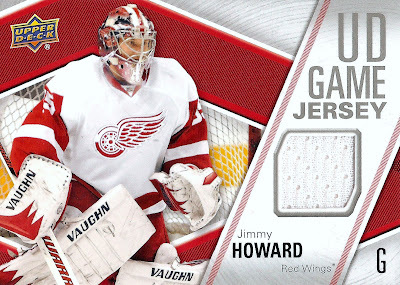 It's a UD game jersey from 2011-12 Upper Deck Series 1. I've seen tons of these hit eBay since it's release, but never wanted to pay the typical $5 or so. I manged to grab this one for just $0.99 plus shipping. Even though the swatch is white on this one, I still really like the card. I look at it this way, at least with the Red Wings jerseys the red is no more common than the white when you take both home and road into account. That said, should there really be a premium for something that is a 50/50 kind of thing? Do you put a premium on colored swatches? I've got two more Howard's on the way from this little spree plus another card for one of my PC projects that hasn't been updated in a while now, so stay tuned for those. Has anyone else heard of these? 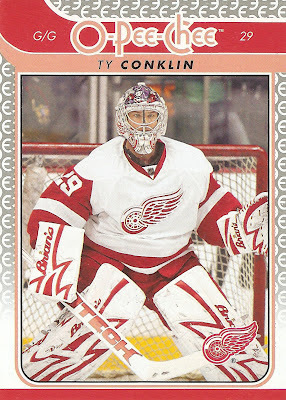 I came across one when I was doing one of my daily Jimmy Howard searches on eBay the other day. I've never heard of or seen one before, so it just kind of stuck out to me. Click here to see the auction for yourself. 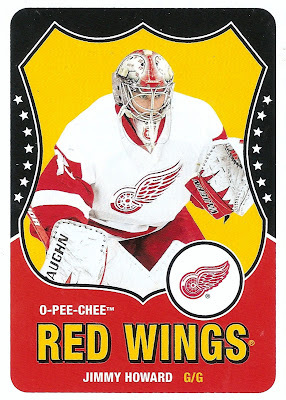 Here's some of the description: "You are bidding on a 2005-06 fleer ultra rookie Beckett raw card review pristine BGS 10 of Jimmy Howard of the Detroit Red Wings. Card #270. Beckett raw card review serial number 221614. 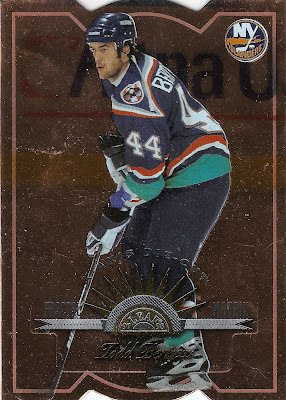 This is an extremely rare card of this NHL superstar!!! So don't miss the opportunity to add this to your collection today!" The other thing that jumped out at me was the BIN price of $129.99. That's kind of ridiculous if you ask me, as I've seen plenty of slabbed BGS 9.5's and 10's for far less than half of that for this very card. What gives? I did a little research and found out that these are in fact legitimate. It's a service that Beckett offers at card shows/expos where they give a raw card and onsite grade, then seal it with a tamper-proof label, like shown above. These can then be sent to be slabbed at a later date for something like $5. Click here to see what I'm talking about. A little while back I realized I hadn't picked anything up on eBay in about a month. That's a long time for me, but when you're just too busy to keep track of auctions, it's easy to miss out on a lot of great deals. Anyway, I finally had some time to watch some eBay auctions and ended up with another great piece for my Jimmy Howard collection. This time it's the Ruby parallel version of the base card from 2011-12 Limited. It's the same as the base card, other than the red tinted background and the red foil at the bottom with "Spotlight" on either side of the player name bar. I think it looks amazing in hand, especially the way the red tint goes with the Wings colors. In case you were wondering, this one is numbered 22/49, which is on the back of the card. I ended up getting this one for around $5 delivered, which isn't all that bad considering it's one of like three I've seen on eBay since Limited came out a while back. Now I just need the base version and a few other tougher parallels. It's been ten months now since I've had any kind of TTM activity here, so coming home from a weekend trip to New York to one of my SASE's was a nice, unexpected surprise earlier today. Back in February I was sorting through some of my monster boxes and put together a stack of cards that would work for my Ink Script project. 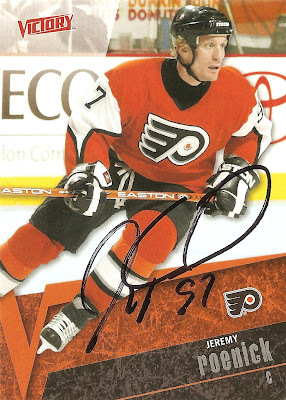 At that time I also saw Dave's TTM update over at Wax Stain Rookie and decided to write to Jeremy Roenick. First, here's the important one for my Ink Script project. 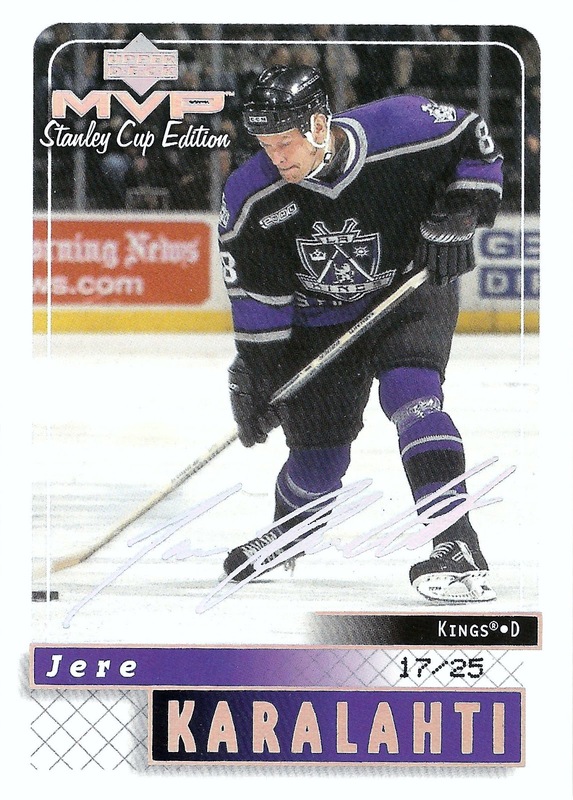 It features Jeremy during his time with the Coyotes and you can see he added his number at the time. The second was this one from 2003-04 Victory featuring Roenick with the Flyers. Gotta love those third jerseys, one of my favorites from before the Reebok era. You can also see on this he added his jersey number featured in the picture. 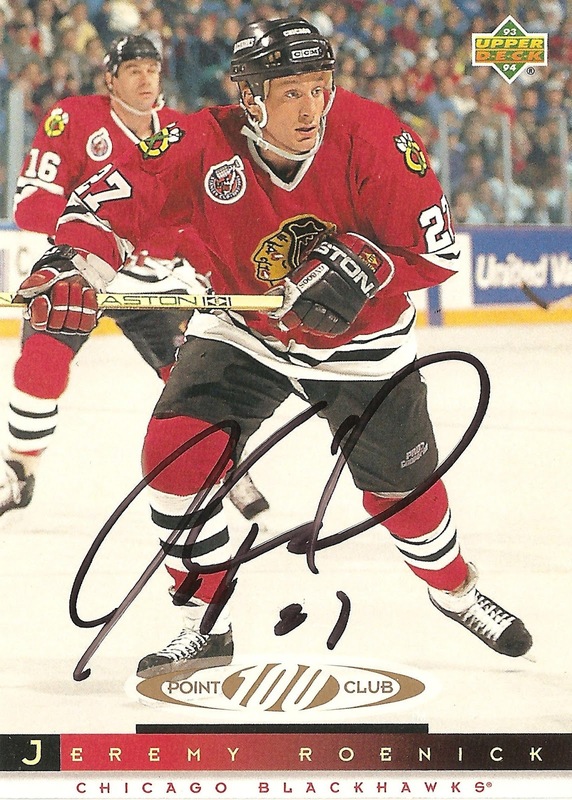 The last one is from 1993-94 Upper Deck and featured Roenick with the Blackhawks. After seeing the news video about how the sports card hobby is dying over at MHCO a little while back, it got me thinking about one of the things I like the most about collecting, my oddball side projects. 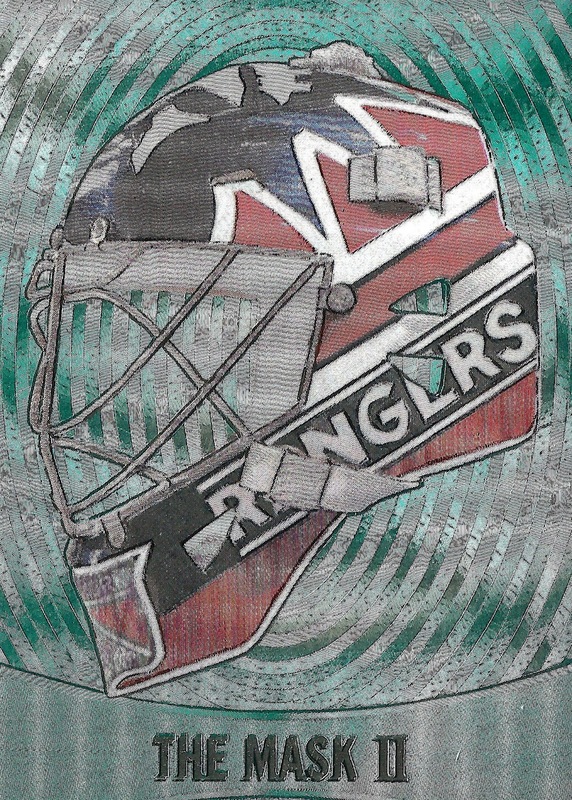 I've got two of them right now in "Captured on Cardboard" and "Goaltending Gallimaufry," both of which have seen some time on the blog lately. 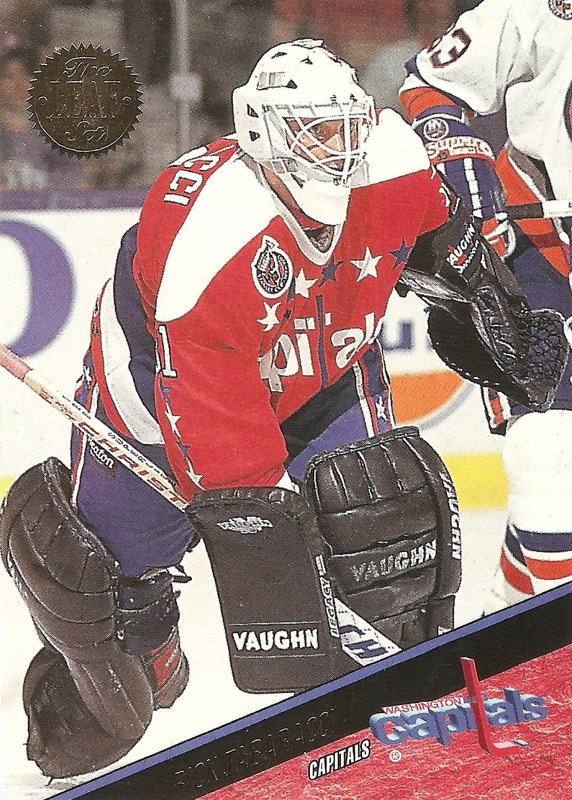 Today, as the title suggests, it's another Gallimaufry post this time featuring three former Washington Capitals goaltenders and their mismatched equipment. This first of the trio is this Rastislav Stana from 2005-06 Victory. Right away you can see something is different as the black/grey/red color combo is a strong contrast to the blue/white/copper of the Capitals color scheme. The equipment Stana is wearing is from his time with the Portland Pirates of the AHL. The second is this Jim Carey from 1995-96 Topps Stadium Club. This time you've got a nice contrast between all the red and white of Carey's equipment with the Capitals color scheme. 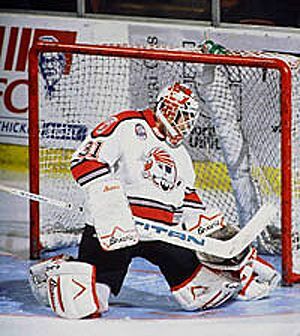 This mismatch is also courtesy of the Portland Pirates, where Carey spent a bit of time, although before they changed their look in the early 2000's. The third is this Rick Tabaracci from 1993-94 Leaf. Going even a little further back this time, you've got Tabaracci wearing all back pads/gloves along with a plain white mask. This one I can't figure out. Tabaracci was acquired from the Jets, who were red, white and blue like the Caps. The only other place he played was Moncton of the AHL, who were also red, white and blue. Anyone know where the all black is from? So there you have it, three more closer to 100. I think the best of the three is probably the Stana, but the Tabaracci is the most obvious when it comes to the mismatch if you ask me. It's kind of hard to miss the solid black against the red, white and blue, isn't it? This series is designed to show off cards that highlight a specific moment in time, one that can easily be recalled. Most cards just have some generic action shot that could've come from any game on any given day. That's why these cards stick out when I come across one. 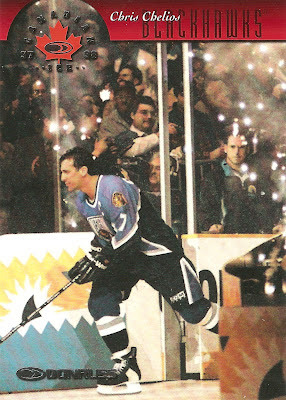 The latest one for this project is this Chris Chelios from 1997-98 Donruss Canadian Ice. As you can see below, this one features a pretty specific moment in time, that would be his entrance/introduction at the 1997 NHL All Star game in San Jose. Now for a look at the video. If you fast forward to the 3:40 mark of the video, you see Chelios preparing to enter the ice for his introduction. Around the 3:47 mark is when the photo on the card was taken, just as the fireworks were set off. It looks like those were only for the starters, so that makes this particular photo that much cooler. 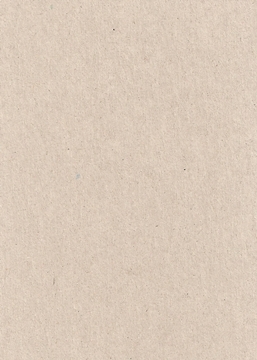 So there you have it, another moment captured on cardboard. This would be another cool little side project, collecting cards featuring all star game intros, wouldn't it? It's been a little while now since I've been able to post one of these, so it's nice to get another group of cards for the collection up here. 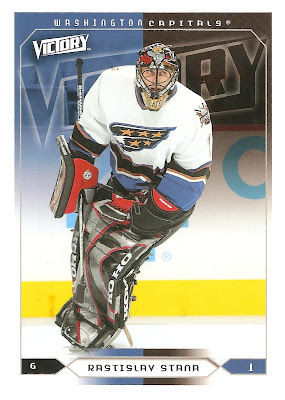 If you remember the first post in this series, there were several Thibault cards from his days with Chicago. 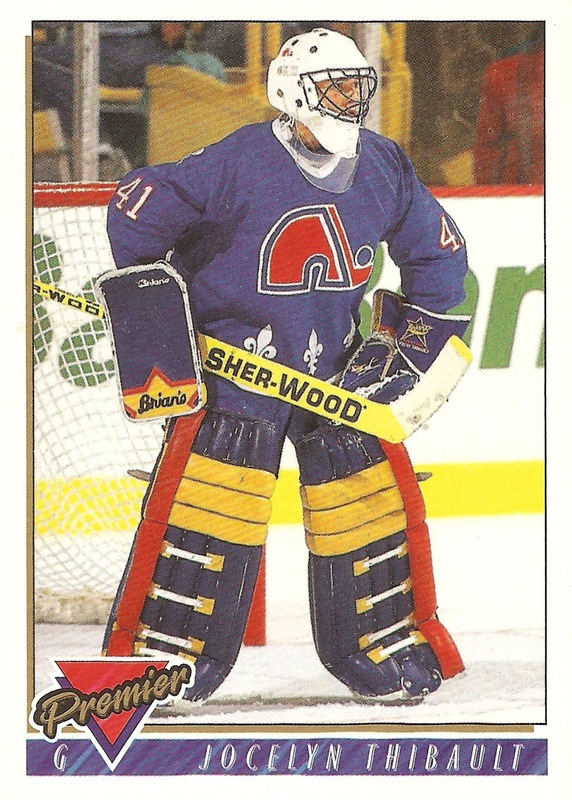 These next three are a bit older and feature him with the Quebec Nordiques. This first one is from the 1993-94 Score set, one I remember seeing a ton of as a kid just getting into collecting. 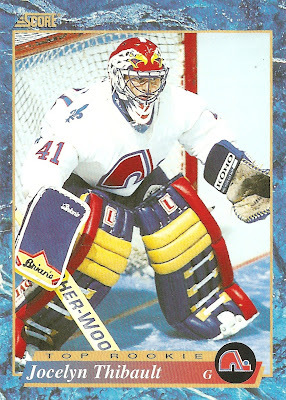 You can easily see the reason this card is here as there is obviously no yellow in the Nordiques color scheme. So what's the yellow from? It's from Thibault's days with the Sherbrooke Faucons of the QMJHL. Click here to see an example of that. 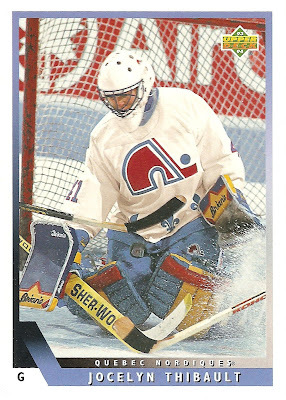 This second one from 1993-94 Topps Premier features the same equipment minus the mask. In this case, Thibault was wearing a plain white mask. Must have been the first piece of equipment he was willing to swap out in order to match his new team's color scheme. Here's one more with the same exact equipment set as the Topps Premier, this time from the 1993-94 Upper Deck flagship set. The only difference here is seeing Thibault in the home white Nordiques sweater. Doesn't look as good as the blue, does it? That's it for now. These three happen to come from cards I've had in my collection all along. It just took a little while to come across them. Kind of makes me want to hit up another card show though. There's nothing better than this kind of project for sorting through dime and quarter boxes. When it comes to player collecting, I'm sure all of us have given up on at least one guy at some point in time. 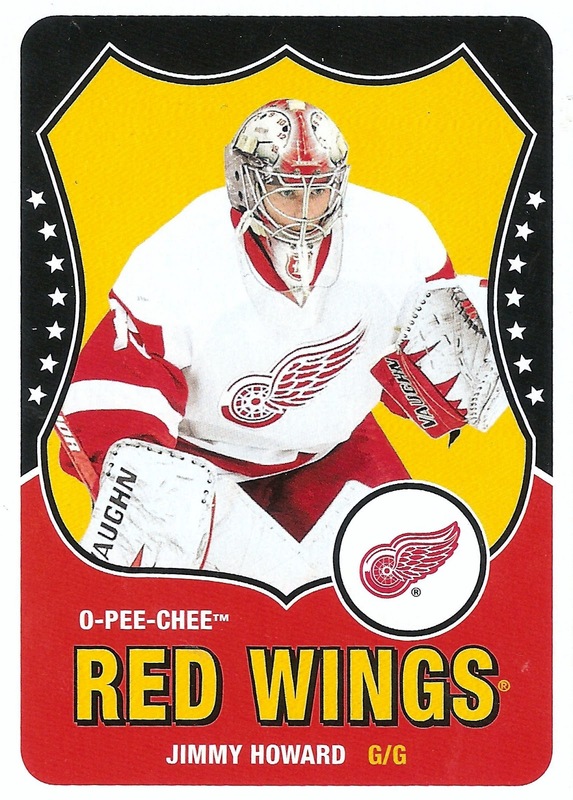 I myself restarted and subsequently quit my Dominik Hasek collection because the number of cards out there was more than overwhelming. For me, it was easy to give up on the Dominator because I didn't invest all that much into it, maybe $5 on dime box pickups and $20 on a few memorabilia cards this time around. 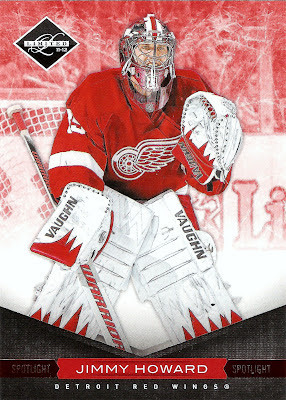 Now, my Jimmy Howard collection is a completely different ball game at this point. I am more than 100 unique cards into it with a few hundred dollars invested over the last few years. So far it's been great, expect for the local premium I pay at card shops and shows around here. Regardless, I believe I have hit the point of no return as I think I've built the collection a solid foundation. I don't see myself wanting to stop any time soon, unless of course this entire hobby falls apart like a certain news outlet is predicting. But seriously, it would be hard for me to quit now as Jimmy is far and away my favorite player these days and it looks like he'll be here to stay for a while now. That brings me to my question of the day: what is your point of no return when it comes to a player collection? Do you even have one? Is there even such a thing? I'd like to get your guy's thoughts either way as fellow player collectors. Here's another pick that is about the picture on the card more so than the actual design of the set. 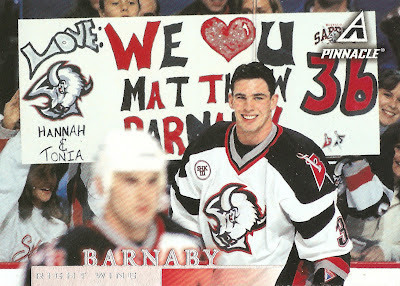 It's a Matthew Barnaby from 1997-98 Pinnacle, a set with plenty of well, interesting photography. This is probably one of the more unique photos in the set, although it would've been much better without the out of focus player in the foreground. This one is definitely on the positive side of the spectrum when it comes to fan signs. The photo was obviously taken during warmups, as I'm sure a sign that big would not sit too well with the fans in the rows behind for very long during any kind of game play. Gotta love the love for Crosby in Philadelphia. The one for Jokinen dissing Sean Avery is pretty good too. What do you guys think? Know of any other good fan-made signs out there? Positive or negative?